Last March, a team of researchers from the California Academy of Sciences descended upon the isolated South Pacific island of Rapa Nui (AKA Easter Island) with suitcases full of rebreathers and fishnets. 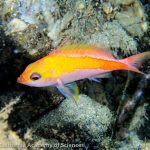 The goal of the expedition was to survey for the very first time this region’s mesophotic reef fishes, with the expectation that many exciting new discoveries would await them. 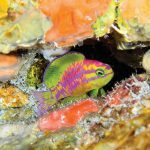 More than 20% of this island’s shore fishes are thought to be endemic, making it one of the planet’s great marine hotspots for speciation, but, until now, little had been known of this deeper fauna. Spoiler alert: they found four new fishes (you can see photos of them here), and the first of these has just been scientifically described. 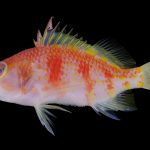 A single specimen of a colorful new perchlet was collected along a rocky patch reef at 83 meters deep, where ambient water temperatures sat at a brisk 19℃ (66℉). 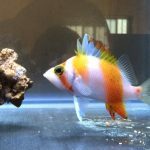 The vibrant yellows and oranges and reds of this stunning new fish reminded the authors of the sun setting below the horizon of this remote subtropical paradise. So they named their fish Plectranthias ahiahiata, from the Rapanui ahiahi-ata, “the last moments of light before nightfall”. 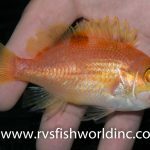 This is now the 57th species in Plectranthias, and with each new discovery it becomes increasingly clear that this group is highly artificial and morphologically sprawling. Many of these taxa, especially those collected from mesophotic and rariphotic depths, are known from very few specimens. With so little material available to researchers, there is only a poor representation of this biodiversity in genetic studies. Based on a single gene, mitochondrial CO1, the closest cousin of P. ahiahiata is the widespread Pacific species P. winniensis, the Redblotch Perchlet. Both share a similarly elongated bodyplan, especially when compared to some of the other perchlets from the South Pacific (P. exsul, P. parini, P. nazcae). But there’s still so much to learn about this group. Specimens of P. ahiahiata and P. winniensis are both small fishes, roughly 4cm in length. Meanwhile, the type species for this genus, P. anthioides, is closer to a foot long and robustly built. Are these really that closely related? Probably not, but it will be a good long while before we know with certainty.